So far we have written about daily life and our community in our first month at Woodstock, but we haven’t mentioned probably the most important (and interesting) facet of life here: the students. This year, I teach 6th-grade, 10th-grade, and 11th-grade English, and Dinesh teaches math and design classes to 6th-, 7th-, and 8th-graders. We both also work with high school students in after-school clubs, so we’ve been interacting with the whole range of adolescence. 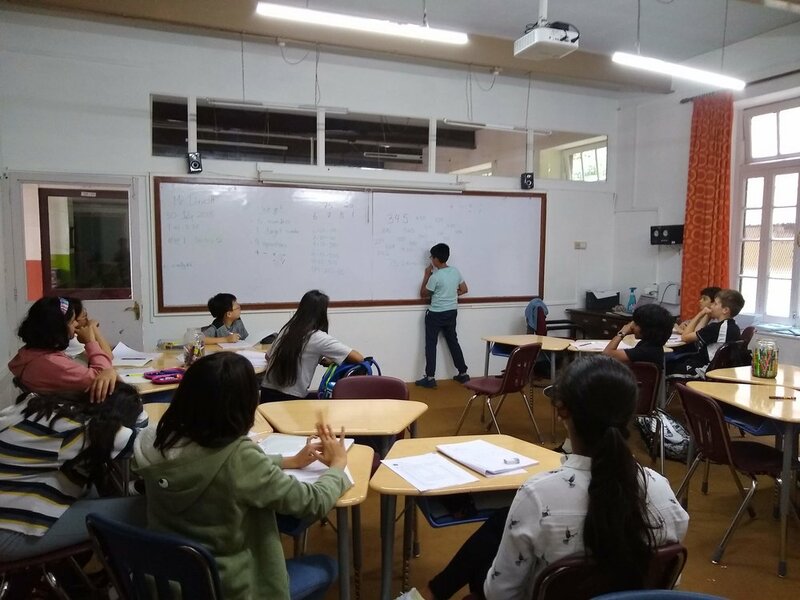 When we left our teaching jobs in Boston Public Schools (BPS), we anticipated that some aspects of teaching would inevitably be different at a private boarding school in the Himalayas. And when we arrived here, some differences were obvious: our students are mostly Indian, though many grew up in other Asian and Middle Eastern countries, and of course they were born with access to many more opportunities than most of our BPS students have. Instead of living at home and commuting to school on multiple buses and trains, our students here live in dorms and trek up an enormous hill each day to school. In my 6th-grade class, we're studying how personal identity is shaped by culture. 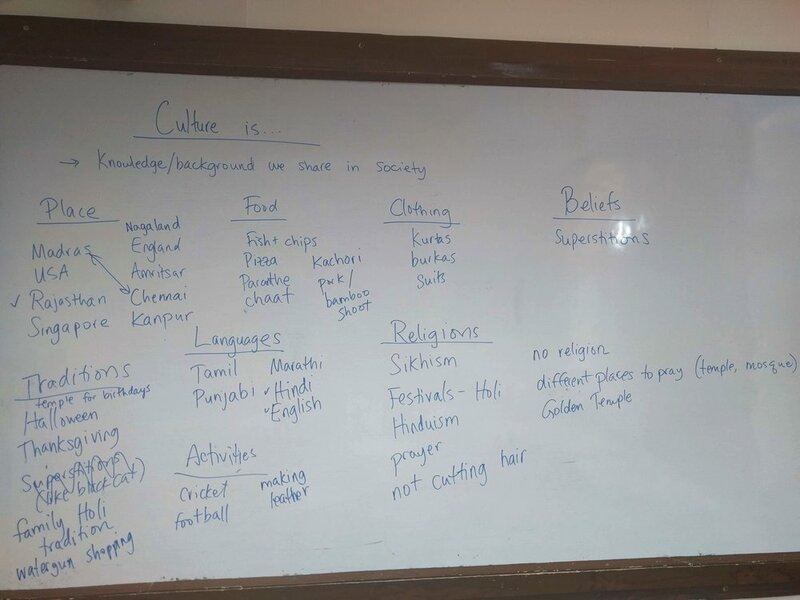 These are my students ideas about their own cultures! But the most important differences we’ve found here have less to do with where our students come from and more to do with Woodstock’s values and the culture and structures shaped by those values. What seems to be the most important value here is community; along with dorm parents, administrators, counselors, staff, and students, we are part of the “village” raising the children here. One community-building structure here is advisory, groups of 10-12 students who are paired with the same one or two adults for their entire middle school or high school career. Similar to advisory at my school in Boston, the goal is to help students build at least one relationship with a caring adult advocate. We meet briefly as an advisor group almost every morning, and Dinesh and I have also taken time to check in individually with our advisees to discuss their goals for this term. A couple Fridays ago, these students came over to our house for “advisor night,” basically a school-sponsored night of quality time. Our group hiked up to our house, where we ate momos and played mafia and salad bowl. By the end of the evening, our students were already planning our next advisory outing and we were feeling a little like happy, proud parents. Another very visible sign of community at Woodstock is the way faculty, staff, and students eat meals. Dinesh and I eat breakfast, lunch, and dinner in the school’s beautiful cafeteria, which means that we’re constantly interacting with our students and colleagues in an informal, friendly setting. Just today, we ate breakfast while chatting with an 11th-grade student (that neither of us teach) about his family, his multicultural identity, and his love for street photography. We’re also learning that in addition to strong relationships between students and adults, Woodstock values student leadership. The school has too many student leadership organizations to keep track of, all of which have their own acronyms or abbreviations: StuCo (Student Council), SAC (Student Activity Council), PAC (Performance and _____ Committee? ?… we’re not really sure about this one). Students are eager to use these platforms to put forth their own ideas, and almost every assembly we attend includes announcements and speeches from students. For a taste of what this looks like, check out this video featuring some of our 11th graders a couple years ago! Outside of making announcements and planning events, our students also show leadership by researching and writing articles for the Woodstocker (Woodstock’s online newspaper), working with younger students (including those struggling with English), and providing audio/visual support at assemblies. Some students argue that their voices aren’t taken seriously enough by the school’s administration, but from our perspective, students are given real responsibilities on campus and rise to the occasion beautifully. Thanks to all these responsibilities and opportunities to explore their passions, the stereotype of Woodstock high school students is that they are permanently sleep-deprived. As one illustration of this phenomenon, one of our 11th-grade advisees takes four AP classes, writes for the newspaper and a short-fiction club, and volunteers for a community outreach program. On top of that, she is starting a podcast with a friend. Outside of the classes, this student receives no academic credit for any of these activities-- she has simply learned what she loves and is driven to pursue those interests. This week, a few of our other 11th-grade students took part in a Wilderness First Responder course on campus, and others traveled to Hyderabad for a Model UN conference. Still other students volunteer their time for community projects like this one in nearby villages and schools. In a lot of ways, student life here feels like life on a college campus, where everyone is busy with a million projects because they’re interested in a million things and don’t quite know how to say “no” to yet another cool opportunity. These Korean high school students choreographed and performed an incredible fan dance at today's Indian (and Korean!) Independence Day celebration-- just one of many ways that students take the initiative to do amazing things around here. Some things about teaching are about the same as in our previous life; we still spend lots of time planning lessons, giving feedback on work, chatting with students, and attending meetings with our colleagues. But Woodstock’s residential environment and opportunities for students to explore their interests and take on leadership roles means that the school’s educational philosophy of “eliciting greatness” is more than just some nice-sounding words; students here are truly supported in becoming more fulfilled, responsible, and kind human beings. Working here is already shaping our definition of what good education looks like, and we’re feeling so privileged to continue to grow as people and teachers here.